President Bush made important gains among Latinos in the 2004 presidential election, capturing 40% of their vote, up from 34% in 2002 and the best share recorded for a Republican presidential nominee, according to a Pew Hispanic Center analysis of exit poll data. The election also marked a watershed moment for the Republican Party. The exit polls showed that 27% of Latino voters in 2004 identified as Republican, a higher mark than the GOP has recorded among registered voters in any of the Center’s surveys. For political strategists, a lingering question is whether the Republican Party will be able to secure and expand on Bush’s 2004 gains among Hispanics, who as noted before are important because they are the only fast-growing part of the electorate and will be for many years to come. The debate over immigration reform divided the Republican Party, as demonstrated by the House and Senate legislative versions and Bush’s own positions. One concern voiced by some Republican strategists is whether Hispanics will hold the Republican Party responsible for the legislation approved by the House, which was advanced by Republicans and which many Latino activists view as punitive. A broader question is whether the Democrats, who among Latino registered voters generally hold a two-to-one advantage over the Republican Party, will make any significant gains as a result of the immigration debate. The 2006 National Survey of Latinos shows that Hispanics to some extent are holding Republicans responsible, though the cost of this in political terms is uncertain. Only 16% of Latinos believe the Republican Party has the best position on immigration, a decrease from 25% in 2004. Almost all of the loss occurred among the foreign born, with the share favoring the GOP on immigration dropping from 28% to 12%. Although most of these Hispanics are not eligible to vote because they are not U.S. citizens, they potentially represent a large and growing pool of future voters. However, Republicans did not lose ground among Latinos who are currently registered voters as the survey showed no change in their views on this point. At the same time, the survey provides little solace for the Democratic Party, which showed no gains among Hispanic registered voters as a result of the immigration debate. 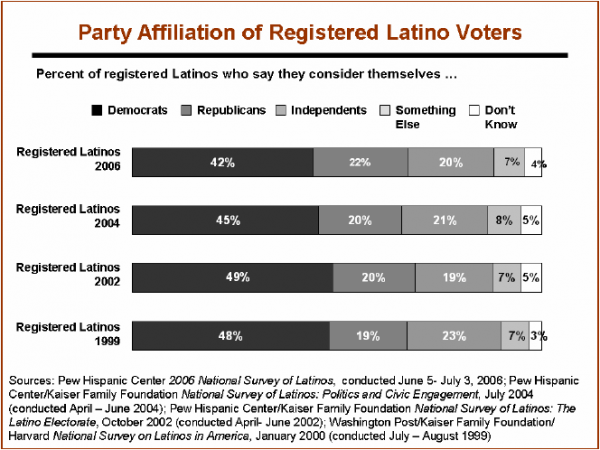 The share of Hispanics picking the Democrats as the best party on immigration issues declined from 2004 to 2006 among both Latinos overall (39% to 35%) and Latino registered voters (48% to 43%). If anything, the survey shows that a growing number of Latinos are dissatisfied with both of the major political parties. One out of every four (25%) now believes neither political party has the best position on immigration issues, more than triple the share who felt that way just two years ago. Similarly, on another question that asks which party has more concern for Latinos, the share of Latinos who see no difference between the parties is the same as those who favor the Democrats (37%). Among registered voters, however, the Democrats have a major advantage over Republicans (46% vs. 9%) as the party that is perceived to have more concern for Latinos. Measures of party identification have been fairly steady over time, although the survey data suggest an erosion of support for the Democratic Party in recent years. In the Center’s surveys, the share of Latinos identifying with the Democrats is down from 49% in 2002 to 42% in the most recent survey. However, the Republicans show no significant gains, with their share at 20% in 2002 and 22% in the current survey.